In March 2018, revision of patent / utility model examination handbook was announced. It seems that the Manual of Patent Examining Procedure of the computer software related invention and the examination handbook accompanied therewith were revised. Points of revision are summarized on the JPO website. I would like to make a note of the points I noted in this revision on Annex B of the Examination Handbook. In the items to be noted (iii) are as follows “Even if only “the computer (Information processing device)” is described in the claims as a hardware resources, as long as the claim states that the calculation or processing of specific information according to the purpose of use, this claim is interpreted as describing the concrete means in which the hardware resources and the software cooperate with”. In short, as long as the process is embodied, it seems that you can think that the claims are accepted as a computer software related invention by making a computer appear as a hardware resource in the claims. This is natural for a practitioner, though making CPU and memory etc. appear in the claims(example written in Japanese MPEP) is unnatural. In any case, according to the notice (iii), it is clearly indicated that “cooperation between hardware resources and software” can be represented by “computer + concrete processing”, if this format is set we can expect that we will not receive unnecessary refusal. Here, examples are described in which the inventive step is affirmed or denied. Examples 1, 2, 4, 5 were technologies related to artificial intelligence. Claim: A method for predicting the welding characteristics of a steel sheet to be manufactured by rolling and cooling after reheating the cast steel piece, wherein the composition of the steel and the production conditions are input values, and welding characteristics of a steel sheet are predicted by neural network. Main cited invention: A method of predicting the welding characteristics of a steel sheet using a mathematical model in which actual values of steel composition and production conditions are input values. Secondary cited invention: A method of estimating the material of glass by a neural network model using predetermined input values. Claim: An image obtained by dividing a myocardial wall of a myocardial section into small regions is input, and it is judged whether or not a necrotic myocardial tissue is included by a neural network. Main cited invention: A system for dividing a myocardial wall of a myocardial cross section into small regions and judging whether or not necrotic myocardial tissue is included in each small region from the image of the small region by the average density of the image of the small region. Secondary citation invention: A neural network learned to determine presence or absence of a predetermined characteristic with respect to the image of the small region divided by larger image. Claim: A method of detecting internal pressure based on a cylinder internal pressure estimation signal outputted from a neural network with a vibration detection signal detected by a vibration sensor of an internal combustion engine as an input value, the method comprising the steps of: changing sampling rates of input values of training and inferring based on the the rotational speed of an internal combustion engine. Cited invention: Although it is specified that the sampling rates at the time of training and inferring are matched, it is not specified to change the sampling rates according to the rotational speed of the internal combustion engine. Claim: A method of estimating NOx concentration in soot by using pressure data in heating furnace, data on temperature of soot and data on CO2 concentration and O2 concentration in soot as input data of neural network. Cited invention: Although it is specified that the data on the soot temperature and the data on the CO2 concentration and the O2 concentration in the soot are used as the input data, it is not specified that the pressure data of the heating furnace is used as the input data. In conclusion, there is no inventive step in Examples 1 and 2, and in Examples 4 and 5 it has inventive step. In Examples 1 and 2, it is said that the subjects, functions and actions are common between the main cited invention and the secondary cited invention, and there are no advantageous effects or impeding factors. Under this premise, the main cited invention can be combined with the secandary cited invention, and those skilled in the art will easily invent claimed invention. In Examples 1 and 2, combining the main cited invention and the secandary cited invention will have the same structure as the claims, so it is natural that the inventive step is denied. If the combination of the main cited invention and the secondary cited invention coincides so much with the claims, it is natural that there is no inventive step and there is no problem specific to artificial intelligence. However, in Examples 1 and 2, the characteristic of claim is the input values inputted to a neural network to estimate specific characteristics, and as I mentioned earlier, I believe that such claims are effective in patenting artificial intelligence related technology. Because the characteristic is not the part of the black box, but the characteristic is easy to identify infringement. In Examples 1 and 2, the combination of the main cited invention and the secandary cited invention was the claim itself, but in many cases, even if there was only a small difference between the claimed invention and the combination of the main cited invention and the secandary cited invention, it is thought that there is a difference. If there is a difference, I believe that by creating a claim so that the effect caused by this difference can be said to be unpredictable from the cited documents, we can increase the possibility to have inventive step. Example 5 is exactly this example. In the claim, pressure data is entered into the neural network, but in the cited invention it is not specified to use pressure data as input data. Thus, if the content of input data is different from the prior art, there is the possibility of acquiring the inventive step in that respect. Therefore, in the practice of artificial intelligence related technology, it is thought that it is important to clarify whether input data has characteristics or not, and if it has characteristics, we have to claim that. Moreover, in the case of Example 5, did the inventor invent only technology related to machine learning? I think that in this case we should consider securing broader rights. For example, in the case of Example 5, we may be possible to complete the invention such as a mathematical model for estimating NOx concentration by inputting pressure in a heating furnace etc. to the mathematical model. In other words, in the invention of machine learning, input-output relations were clarified using machine learning, but after the input-output relationships became clear, this relationship can be applied to the something to achieve original goal without using machine learning. I believe that the right to such inventions should also be kept in mind at all times. Because a patent of machine learning can be too narrow, and I think that it is not easy to identify infringement. In example 4, the claim expresses scheme in sampling the input value to the neural network, and the cited invention does not express the same scheme. When input values to the neural network and output values from the neural network are known, it is obviously difficult to acquire the inventive step in the claims focusing only on inputs and outputs. In this case, as described in example 4, it is considered to be one good practice to focus on factors different from the input value itself, such as scheme to prepare input data. In particular, in CNN (Convolutional Neural Network) etc., in many cases, it is considered that the input data format is merely RGB data and image data without characteristic. In such a case, it seems that there are many cases that you have to search for characteristics in input data processing and interpretation of output data. When patenting artificial intelligence related technology, we should keep in mind that. Addition of patent examination handbook on AI related technology. Blog > 実務 > Addition of patent examination handbook on AI related technology. It seems that a case has been added to the patent examination handbook on IOT related technology and AI related technology. It is summarized as reference material at the bottom of this page of the JPO website. As for AI related technology, following examples are added. Case 3-2: A case where machine learning was applied to forecasting sugar content data of apple. Case 2-13: Data structure of the dialogue scenario of the spoken dialogue system. Case 2-14: Learned model for analyzing the reputation of accommodation facilities. Case 31: a learning system having an in-vehicle device and a server. Case 32: Quality control program for the production line. This is the example to describe that a feature of ”predicting and outputting sugar content data of apple at the time of shipment in the future using the sugar content data of apple for a predetermined period and past / future weather condition data as input” can be statutory subject matter. In this example, the artificial intelligence related technology is not explicitly stated in the claims, which is no different from the style of the conventional claim. It can be said that it obviously falls under the invention from the software related examination procedure. The significance of the addition of this case seems to be that the forecast is machine learning. Machine learning does not appear in the claims, but ”analysis for prediction is performed by machine learning” and ”realization method of machine learning” are supposed to be disclosed in the specification. When creating a claim on prediction using machine learning, in many cases, I think that the style of this claim will be adopted. Because, as we wrote in the previous blog, determining the input data in many artificial intelligence-related technologies is an important factor for achieving the objective and invention, and the technical features do not appear in machine learning itself. Since case 3-2 introduced here is a case to discuss statutory subject matter of invention, it is necessary to note that the patent office does not say anything about the validity of the description in the description. When applying for a patent application, it is obvious that we have to disclose more information than example specification. For example, as a disclosure example of the specification, how to proceed machine learning is shown, but in case of actually applying for a patent, it is considered that machine learning should be disclosed in more detail. Also, if the disclosure for prediction is machine learning alone, there is a fear that it may correspond to excessive generalization. We have to think that whether prediction method other than machine learning is available or not, whether prediction methods other than machine learning may be useful for the applicants or not, etc. If necessary, the prediction method other than machine learning should be written in the specification. Case 2 – 13, Case 31, Case 32. Case 2 – 13 is an example where the claim as a data structure of the dialog scenario used in the spoken dialogue system corresponds to ”invention”. Case 31 is an example of denying the inventive step of claim which improves the parameter of image recognition performed by the in-vehicle device by machine learning within the server. Case 32 is an example of denying the inventive step of claiming machine learning based on inspection results and manufacturing conditions in the server in order to perform quality control of the production line. In these examples, artificial intelligence and machine learning are used as embodiments, but it seems that an artificial intelligence related technology does not affect the statutory subject matter or inventive step. Is it simply the addition of cases of artificial intelligence related technology? In a few days, the patent office examiner will have a workshop to explain additional cases, so I would like to confirm the position of this case. This is an example showing that the claimed ”learned model” corresponds to ”invention”. I think that it is a very useful case. At the moment, the Patent Office seems to believe that the claim of the category of learned model can be statutory subject matter. I do not know how the court thinks, but as there is no worry that the claims called learned models will be rejected due to inadequacies in the category for a while, the choice of application strategy will increase. Without this case you may have created a claim as a program rather than a learned model. Furthermore, in this case, the claim of the learned model is created with the structural feature of the neural network. Weighting coefficients that can change by learning also appear in the claims, but the features of the weighting coefficients are not stipulated in the claims in detail so as to suggest a relationship of input and output. Weighting coefficients are specified in the claims as much as necessary to describe the structure features of the neural network. From these facts, at least the JPO seems to think that the structure of the neural network can be statutory subject matter. From now on, applicants who apply artificial intelligence related technology have to be constantly conscious of whether neural network structure is novelty or inventive step. 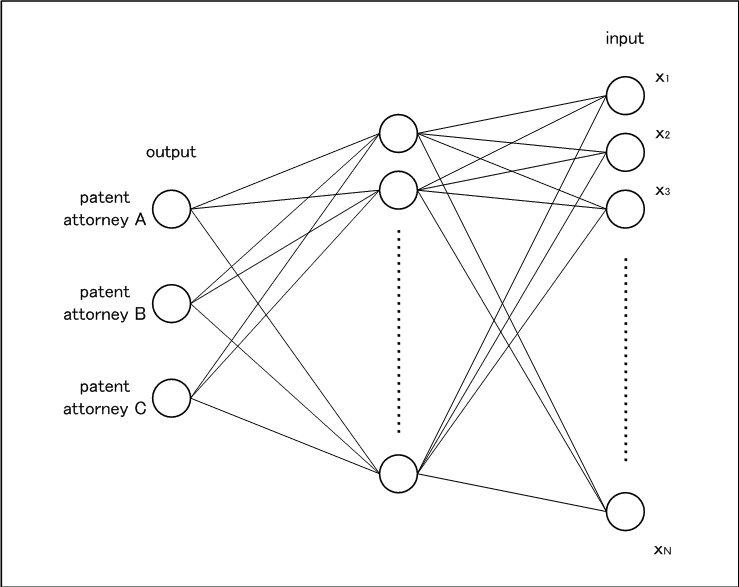 Of course, it is always necessary to consider whether applying the structure of the neural network is significant for the applicant’s patenting strategy. Cases mentioned above were added ones. In the added cases, neural network and support vector machine will appear, but I think that it was good if the examples of other technologies, such as reinforcement learning, are added too (I believe that reinforcement learning is important for artificial intelligence related technology). Let’s expect for future additions. Logo of TensorFlow (eg this link) always reminds me of the role of a patent attorney. This logo looks T in one direction and F in another direction. I always think that as a patent attorney I should face a meeting with such a stance. The invention will be totally different when you change your perspective. TensorFlow. If you are interested in artificial intelligence, I think you have heard it before. There may be many who have actually tried it out. It seems that it has been a while since open source conversion. Not limited to TensorFlow, various libraries for artificial intelligence development are released free of charge. I did not know that such a library was released for free until I heard the news on public release of TensorFlow, so I was a little shocked when I heard the news. With TensorFlow, it will be possible for amateurs (eg myself) to develop technology to solve familiar problems with just ideas and a little programming knowledge. Until a while ago, I think that technology development was like a kind of privilege, which is realized by human resources who acquired expertise belonging to the development department with well-developed environment. However, if anyone can use the library for free, there is no barrier to at least part of artificial intelligence development, and it seems that anyone can become a developer. If you collect source data on the net and do machine learning using TensorFlow, I think that you can do quite a lot. Actually, a lot of articles are posted on the net such as “I tried ○○ with TensorFlow”. The world where development barriers fell. It seems like a very good world as an ordinary person. Because there is a possibility to create meaningful things from a little idea. On the other hand, if you look at the world as an applicant who invests development, I think that it is quite a difficult situation. Compared to other technologies, artificial intelligence related technology seems to raise very rapidly the level of technology considered to have inventive step. While developers with specialized knowledge advance development using their own facilities, even those who do not have expert knowledge can try out their own ideas. And, if some achievement is obtained, there are many people who publish it on the net. These acts increase the prior arts that are the basis of the inventive step judgment at an extremely fast rate. At least it seems that the level of inventive step will rise much easier compared to general fields such as automobile engine development where special environments are essential. I think that it has become a serious era. Companies that intend to develop artificial intelligence related technology and intend to get a patent seem to need to file at a tremendous speed. Few days ago, I have seen the news that artificial intelligence related applications by Japanese companies delay much compared to foreign companies (especially US companies, Chinese companies). I hope that artificial intelligence development in Japanese companies will become active more. A patenting strategy derived from a simulated experience of artificial intelligence development 4. Blog > テクノロジー > A patenting strategy derived from a simulated experience of artificial intelligence development 4. The first entry is here. The second entry is here. The third entry is here. In the development related to the neural network, it is likely to have many inventions at two stages below. 1. Selection of input data and output data. 2. 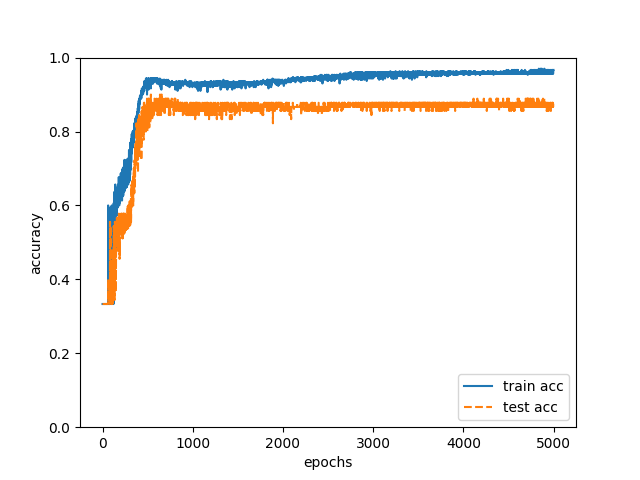 Structure determination of neural network. As for 1. mentioned above the decision of input (or output) to achieve the purpose, is an important invention itself. In this development, we confirmed that authors can be estimated with high accuracy using “habit of document expression” and “habit of flow of logic “. And we can say that this way of thinking is the invention. When we use a deep neural network, useful results can be obtained by inputting a large number of data and advancing learning by the deep neural network without considering what input data is important for achieving the purpose. But even so, I think that it is important to identify which of the input data among many input data contributes greatly to the achievement of the purpose. Because the claim should write essential elements only. Various strategies are conceivable as a patenting strategy when the essential input data A can be identified. I would like to pick up some of them here and write. First of all, I would like to mention some of the strategies for expressing devices that estimate with learned data as the following claims. · Input data A (possibly also output data B) is a feature of the invention, and the process of machine learning is not characterized. As experienced in the 1st to 3rd entries, determining the input data is an invention and it can be said to be an important factor to achieve the objective. · In addition, it is considered that there are many cases that a neural network can advance machine learning with well-known technologies (examples shown by the 1st to 3rd entries seem to correspond to this case). For devices that do not learn after learning with learned data, it is important to make a claim that does not include a learning unit that performs machine learning as an element. If the learning unit is included in the element of claims, injunction by direct infringement against an apparatus that is learned before shipment and not learned after shipment will be impossible. · However, it will be necessary to take countermeasures in the claims or specifications so that they are not obscured by the phrase “based on machine learned information”. In the case where the technique for advancing machine learning is generic, we should explain the technique is generic and we should give some examples. And if it is not the feature of the invention, its reason should be described in the specification and satisfy the enabling requirement. · Since parameters after machine learning, such as weighting factors, bias, etc., are created by machine learning, we think that it is preferable to write a specification so that it meets the criteria for product by process examination. · Since the feature of the invention lies in the input data A, we think that it is preferable to develop the features of input data from a superordinate concept to a subordinate concept. In the case of the 1st to 3rd entries, there are many perspectives such as statistics of punctuation marks, statistics of conjunctions, statistics of end-of-sentence expression. Next, I would like to mention some strategies when we make following claims of an apparatus that can learn. · This claim will be effective if products that users can conduct learning and conversion (conversion of input data A to output data B) are sold. · It is worth considering to make a claim that a learning apparatus comprising a learning unit (a device not equipped with acquiring unit and conversion unit). · Only essential pairs of sample input data a and correct answer data b should be written in independent claims, and other pairs examined in the development process (for example, groups that contributed to improve the accuracy rate but are not the most important) should be written in the dependent claims. · If the user lets the device learn, the method claim is effective. Finally, as for the structure of the neural network, I think that the structure of the neural network is patentable if the structure of the neural network has novelty and has the inventive step. However, in this case it is thought that it is necessary to carefully prepare claims. Even the claims featured by the structure of the neural network are patented, it is often difficult to prove that the suspected product of a third party is using the claims. Since it is expected that the structure of the neural network is often a black box when viewed from the outside, there are many cases where it is not effective even if the structure of the neural network itself is patented. If it is virtually impossible to prove that a suspected product of a third party is using that claim, it is meaningless to file for infringing goods countermeasures. If there is no other circumstance (for example, sooner or later it will be announced at the academic conference), I think that we should think carefully whether we should apply for the application or not. · If it is necessary to patent the structure of the neural network, we think that it is necessary to find features that can be observed when analyzing a device that uses the structure of the neural network. In the meeting before the patent application, it is necessary to find the observable features. If we cannot find the observable features, I think we have to ask the inventors to analyze for finding features. Although it is not a structure of a neural network, it is considered effective to apply parameters optimized by machine learning. For example, it is conceivable to specify the optimal numerical ranges such as the composition of the functional material and the temperature, pressure, etc. when preparing the material by machine learning, and the numerical range of that is claimed. It is normal practice to describe actual measurement results within the numerical range and actual measurement results at the boundary of the numerical ranges in the specification. But by describing the process of deriving the numerical range by machine learning in the specification, is it possible to satisfy the description requirements (enforceability requirement etc.) of the specification? If the numerical range is obtained by machine learning and the effect in that range is logical, the specification is described so that the invention in a specific numerical range can be implemented by showing the process of machine learning, I feel that the cases where the description requirements are satisfied may come out. It is unknown at this moment how examiners and judges think, but it seems like an interesting topic. A patenting strategy derived from a simulated experience of artificial intelligence development 3. Blog > テクノロジー > A patenting strategy derived from a simulated experience of artificial intelligence development 3. In the 1st and 2nd entries, we showed that the authors of the specification could be estimated with high precision in the neural network. However, in the 1st and 2nd we only changed the input data. In the development of the neural network, the structure of the neural network is considered to be a big theme. When we develop the neural network, the structure of the neural network such as the number of layers and the number of nodes will be the subject of consideration first. But as is well known, it is important to change the initial value and use various optimization methods (The first and the second were all SGD). Various methods are conceivable, but first of all it is possible to make the layer deep. Since there are only 18 items (the number of input nodes) in this development, it can be anticipated that a large number of layers will not be required. For the time being, we learned the hidden layer as two layers (13 nodes, 8 nodes) by using training data and test data of “Both habit of document expression and Habit of flow of logic”. The result is 98% correct answer rate. About 90 cases of test data it means 2 incorrect answers. It is a very high accuracy rate. For this matter, we can say that a deep neural network is not necessary. It is understandable. We have too few input nodes. 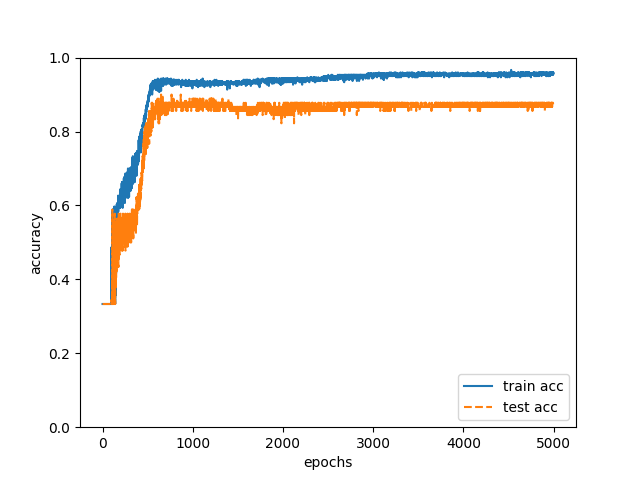 The sample was inappropriate to simulate the development of the deep neural network. Well, even though the sample was inappropriate, I think that the high accuracy rate is accomplished because the input data was suitable for estimation of the author. Initially, I wanted to improve the rate of correct answers gradually while using modern technic like a self-encoder (ten years have passed since self-encoder became a topic). In addition, not only simple neural networks, but also the complicated structure of the network, such as inputting the output of one node to the other node in the same layer, there are various ingenuity in the structure of the network. 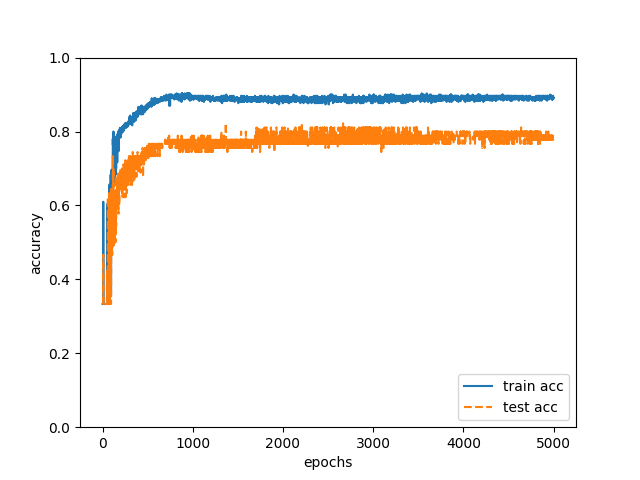 However, judging from the results so far, it seems that there is not enough sample to be able to judge the structure of the neural network and the usefulness of various techniques in the current sample. Although there may be room for further improvement, even if the correct answer rate becomes 100%, I cannot conclude the reason of high accuracy rate is achieved by the structure change of the neural network. It can be just a coincidence. Therefore, I would like to try development with a self-encoder etc. in another project in the future (I think that it is good to experience the development with word 2vec and Q learning at present). Now, since I first experienced the development process related to the neural network in the 1st to 3rd entries, I would like to think about the patenting of the invention which can occur in the development process next time. The fourth entry is here. A patenting strategy derived from a simulated experience of artificial intelligence development 2. Blog > テクノロジー > A patenting strategy derived from a simulated experience of artificial intelligence development 2. In the first entry, we showed that we could estimate the specification authors with high precision in a simulated developed neural network. In the development process, the neural network learned based on the following three patterns of input data. 1. Habit of document expression. 2. Habit of flow of logic. 3. Both habit of document expression and Habit of flow of logic. Below, I will concretely describe each pattern. This is the plan mentioned in the 1st entry. In this plan, the following 11 items were digitized for each specification before learning. Number of lines of main claim, number of characters of main claim, average number of lines of subclaims, average number of characters of subclaims, number of commas per line of claims, number of characters per line of claims, average number of commas per paragraph of the specification, average number of characters per paragraph of the specification, number of commas per specification, number of characters per specification, the number of characters of the specification. Details of learning are as follows. · Training data: 300 data correlating the numerical values of 11 items with the author. · Test data: 90 data correlating the numerical values of 11 items and the author. · Hidden layer: One layer with 7 nodes. · Mini batch: about 10 to 50. · Optimization method: stochastic gradient descent. · Iteration: 50000 times. By doing the above learning with training data and estimating 90 authors of test data in the neural network after learning, the correct answer rate was 88% (Fig. 1). In this plan, we measured the number of seven words below for each specification before learning. “However”, “still”, “namely”, “also”, “further”, “could be “, “and”. I often write sentences in the description in the order of “assertions, commentaries, arguments, and exemplification” in order to explain logically. When writing sentences in this order, “namely” appears before “commentary”. Since the habit of logical explanation differs for each author, I thought that the authors can be identified by statistically processing the words in the first part and the last part of the paragraph. The details of learning are the same as “1. Habit of document expression” (however, the number of nodes in the hidden layer is five). By doing the above learning with training data and estimating 90 authors of test data, the correct answer rate was 79% (Fig. 2). As described above, the correct answer rate of 79% was obtained when “1. Habit of document expression ” was used as input data, and the correct answer rate of 88% was obtained when “2. Habit of flow of logic” was used as input data. This result was different from my intuition, so I was a little puzzled. If I estimate authors by myself, I pay attention to logic flow more than the number of punctuation marks. Although “2. Habit of flow of logic” may have disadvantage because the number of items is small, I can say that “1. Habit of document expression ” is effective to estimate the authors. Based on this result it is impossible to exclude the idea that “1. Habit of document expression” can be used as input data if seriously applying for a patent. Furthermore, although the percentage of correct answers is somewhat reduced, the correct answer rate of 79% can be obtained even in “2. Habit on flow of logic “, so if you apply for a patent, applicant should not omit “2. Habit of flow of logic ” from claims. A significant correct answer rate was obtained when one of “1. Habit of document expression” and “2. Habit of flow of logic” was used as input data, so it will be possible to estimate more accurately if both are set as input data. Therefore, I let the neural network learn based on “3. Both habit of document expression and habit of flow of logic”. We created training data and test data by combining the input data used in “1. Habit of document expression” and “2. Habit of flow of logic”. The detail of learning is the same as “1. Habit of document expression” (nodes of the hidden layer are 11). 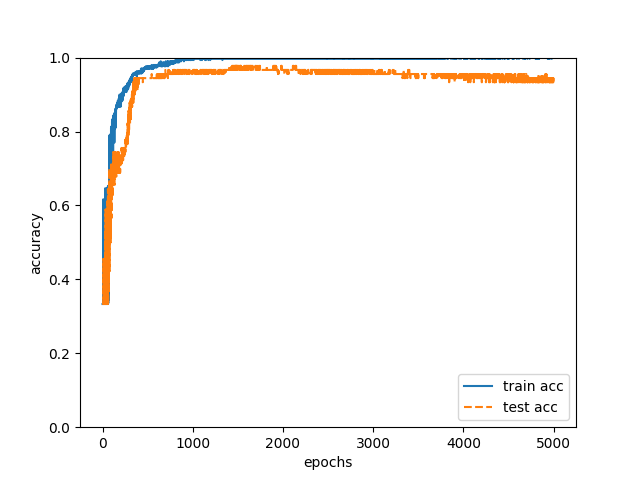 We conducted the above training with training data and estimated the authors of 90 test data in the neural network after learning, the correct answer rate was 93% (Fig. 3). 84 of the 90 test data have been able to accurately estimate the author. It was proved to be effective that “1. Habit of document expression” “2. Habit of flow of logic” “3. Both habit of document expression and habit of flow of logic ” are very useful as input data for estimating the author of the specification. On the other hand, in developing neural networks, it is necessary to optimize the structure of the network. Next time we will report the result of changing the structure of the network. The fourth entfy is here. A patenting strategy derived from a simulated experience of artificial intelligence development 1. Blog > テクノロジー > A patenting strategy derived from a simulated experience of artificial intelligence development 1. When I was a student, we had to find a good book first before starting study. But it took a long time before I came across a good book. Now we can find a good book as soon as you search, and you can read good information on the web without purchasing a book (thanks google). Many MOOC lectures at the university level are free, so people with motivation can learn as much as you like. Recently, I am concentrating on learning artificial intelligence related technology, but I feel that I could learn efficiently at very low cost by using the net. I would like to thank the net related technology. Since I am a patent attorney, I am interested in patent rights of inventions, but I always think that we need to understand technology deeply first before thinking strategy of the rights. Therefore, I believe that deep understanding of technology is extremely important to me even for artificial intelligence related technology. For deep understanding, I thought that development was the best and tried to simulate the development of technology to achieve a specific purpose. Through simulated experiences of development, I aim to study the patenting strategy of artificial intelligence related technology. I got some results, so I will record the result of learning. The outline of development is as follows. · Target: Development of artificial intelligence that identifies the author of the patent specification from the features of the patent specification. · Usage technology: Neural network. The neural network adopted is as shown in Figure 1 below. There are three patent attorneys in our office. Comparing the publications of the specifications written by each patent attorney, it seems that each specification has its own style. Therefore, if the analysis result of each patent attorney’s specification is used as input data and three nodes corresponding to patent attorneys’ A to C are used as output data, I thought that we could develop a neural network which inputs features of the specification and outputs the author. The output node is made to correspond to each patent attorney (the maximum value of the output of the node is the estimation result of the author). And it seems that we can develop a neural network which can obtain meaningful output by determining input data, and by choosing an appropriate neural network. First of all, we need to determine input data. In the meantime, the neural network is configured to have one hidden layer as shown in Fig. 1, and a number of nodes of the hidden layer are constructed by a middle number between the number of input nodes and the number of output nodes. I thought of 3 patterns of input data. 1. Habit of document expression. 2. Habit of flow of logic. 3. Both habit of document expression and habit of flow of logic. Since both features do not depend heavily on the technical field and appear more or less in all the specifications, if we can quantify these features, we will able to estimate the input data corresponding to the author can be created. Once we have decided on such a development policy, the next is practice. We prepared 130 patent specifications written by each patent attorney. We convert these into text data, statistically process text data from multiple points of view, and use the multiple values obtained as input data. Through such preprocessing, we prepared 390 teacher data (pairs of input data of multiple nodes correspond to one of patent attorneys A to C). This time we have 300 of training data and 90 of test data. From the training data, 50,000 iterations were performed using data representing habit of document expression, the accuracy of training data was 96% (train.acc), and the accuracy of test data was 88% (test.acc). 88%! I am surprised. It is too much success, isn’t it? There is still much room for improvement, such as obvious over learning. Normally when I read the specifications written by each patent attorney, I can presume that “this specification is likely written by patent attorney A” and so on. But it is surprising that a neural network can presume the author of specification with probability of about 90%. Surprisingly the habit of the author appears quite obviously in the specification. It is impossible for humans to estimate authors with this accuracy, right? I realized the potential of the neural network. Well, as this entry becomes long, I will describe the concrete analysis next time. “Making Deep Learning from scratch” O’Reilly Japan. Yasuhiro Saito. The explanation was very easy to understand. Without this book I think that I could not get the result of this. “Introductory programming for language research” Kaitaku-sha Yoshihiko Asao, Lee Je Ho. “Deep.Learning”, https://www.udacity.com/course/deep-learning-ud 730. It is a lecture that gave me a chance to learn Deep Learning by myself. I have widely and shallowly researched civil court’s decisions (decisions of infringement suits) about computer program works, as a task of Copyright Committee of the Japanese Patent Attorneys Association where I’m belonging. Here, I will show secondary results of the task in several times. Primary results of the task will be shown by the Japanese Patent Attorneys Association. 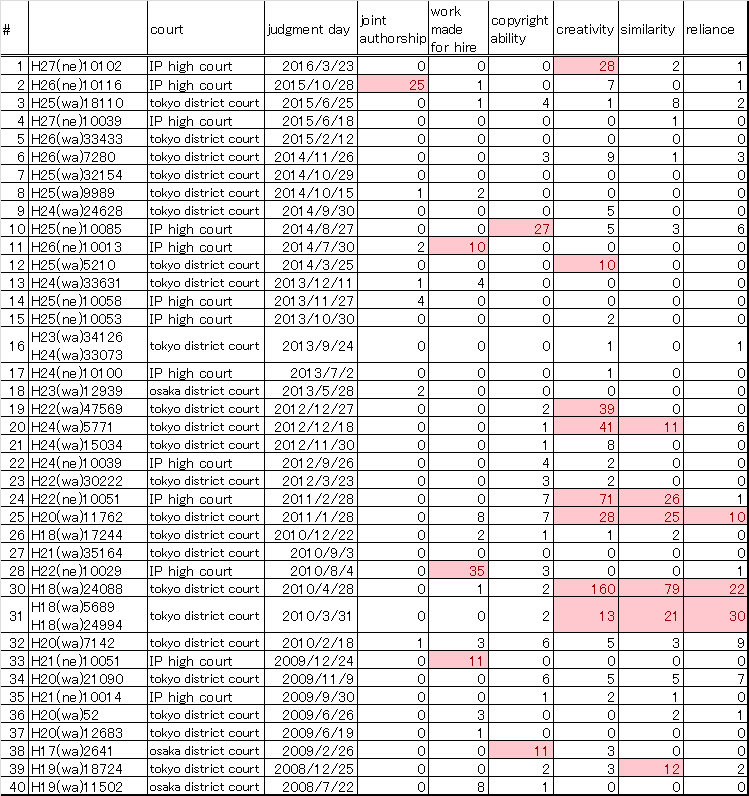 In this entry, I will show a result of a keywords analysis of the decisions about the computer program works. Method of the analysis was comprised of a first step and a second step. In the first step, plain text files of resent 80 decisions were prepared. In the second step, I searched the keywords on the plain text files. The second step was performed by using a personal computer (executing program with grep command-line). The second step finished in a moment. The performance of the personal computer is surprisingly high! The result (a part of the result) of the analysis is shown in a table below. Numeric in each cell shows number of keywords included in each of the decisions. Each cell whose numeric is not less than 10, is marked with red. The highest number was reached up to 160. It can be understood that the highest number was appeared in “creativity” and the second highest number was appeared in “similarity”. Further, I calculated a coefficient of correlation between the number of “creativity” and the number of “similarity”. The number of “creativity” and the number of “similarity” were strongly correlated because the coefficient of correlation reached to 0.87.
in the infringement suits about the computer program works. Now, I am about to close this entry. And I will get further into contents of the decisions with focusing “creativity”, in the next entry. Knowledge Partners celebrates its tenth anniversary in 2017. Privately, it was a very fulfilling 10 years with environmental changes such as marriage and child rearing. In the work relationship, there was a severe environmental change such as recession due to the subprime problem and a sharp decline in the number of patent applications, but I believe that we have managed the office relatively steadily until then. Management stability is a desire, but if you are satisfied with maintaining the status quo, it is not stable but stagnation. So I reviewed the ToDo list on this occasion which is the tenth anniversary. From this year I would like to act a little at a time. We renewed website. I will restart my blog. I want to prevent fade-out this time. Ideal to meet people who can respect them through websites and blogs. Although I had an excuse that I was kept busy, I thought that study group of practitioners was extremely effective for self-improvement. I plan to invite participants by deciding the outline soon. I hope the participants will be gathered on a scale that allows meaningful discussion. I have visited overseas attorneies. The busy season of the industry ends in March, and the workload is relatively small in April and May, so even if it is planned to be absent for about one week I can do it without difficulty. It was a good opportunity to be aware of how Knowledge Partners would look from the outside. I want to go out on a regular business trip on a regular basis. In the next decade, in order to continue to be the expected office for the next decade, I think that we will make an organization that can respond to change. Copyright c 2016 Knowledge Partners. All rights reserved.